CAD Studio cooperates with the Technical University in Ceske Budejovice (VSTE) and as a part of this cooperation, VSTE students prepared a large library of BIM objects of real MEP products for Revit. Our CAD/BIM library at CADforum.cz Blocks now e.g. contains an extended choice of 3D models of KORADO heating panels. The KORADO BIM library contain steel radiators (wall heating panels) - the product lines RADIK - RADIK KLASIK, RADIK KLASIK - R (steel panel radiators for reconstructions) and VENTIL KOMPAKT (RADIK VK). This adds to the existing BIM models RADIK VKU, RADIK VKL, RADIK VKM , RADIK COMBI VK and PLAN (RADIK PLAN KLASIK, RADIK PLAN VK, RADIK PLAN VKL, RADIK PLAN VKM). 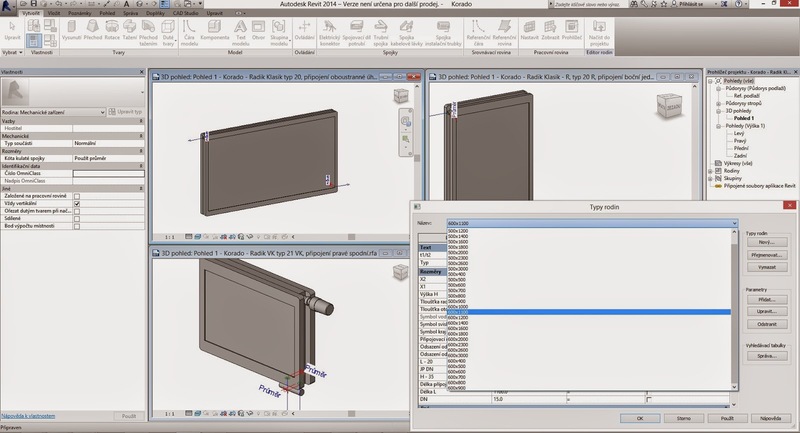 The Revit family files (RFA) contain fully parametric 3D models and 2D symbols and other technical data as specified by the manufacturer. The 46 newly published RFA files also contain a vast number of family types (with thousands of variants), so you can find a type catalog (TXT) with every RFA file. Type catalogs contain all types in a given family and you can choose the types you need for your current project when you load the RFA file (making the project file smaller). The type catalog text files must have the same name as the respective RFA file and must be stored in the same folder - so do not forget to download also the TXT attachment with the RFA file from our online library. 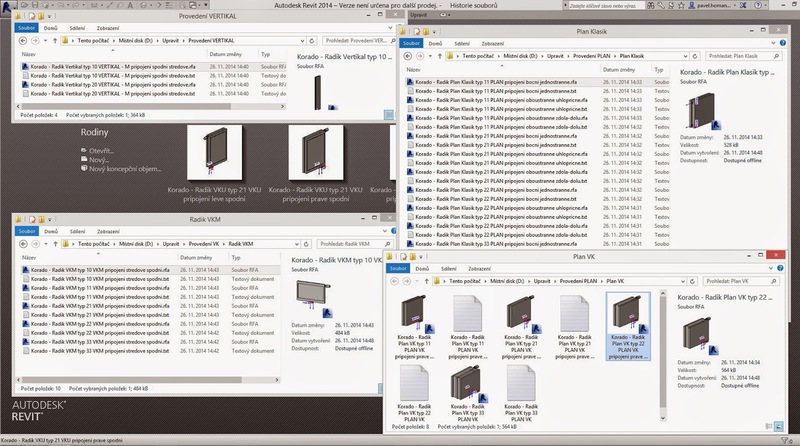 You can use these library elements in the BIM software Autodesk Revit versions 2014 and 2015. The author of the families is Bc. Michal Marek.